Hello, hello! Are you a lace-loving bride? Do you like the classic look of lace, but you’re unsure how to pull the look together with the perfect accessories? You’ve come to the right place! 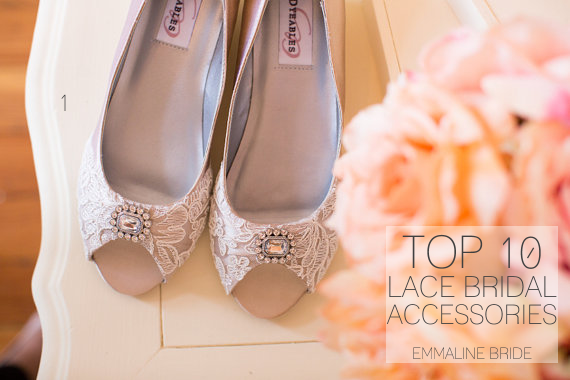 Today we’re sharing the top ten lace bridal accessories we’ve spotted on the interwebs with everything like a chic lacy bolero, a wedding dress (with oh-so-lovely lace sleeves), a pair of gorgeous lace-embellished heels, and more. 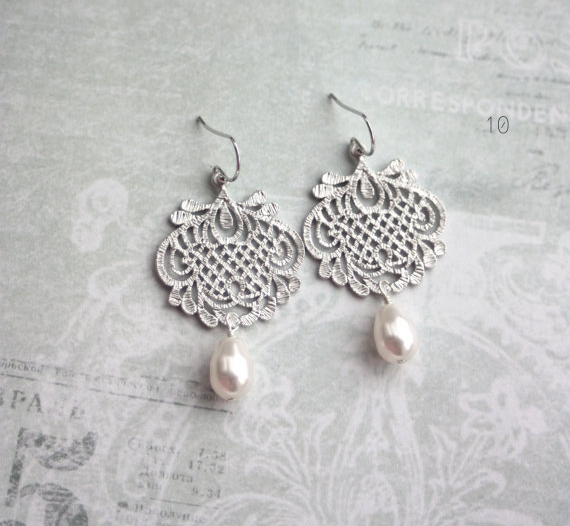 Plus, we’re giving away one of these accessories in a special wedding giveaway! Enough talking about it, let’s get to it already! 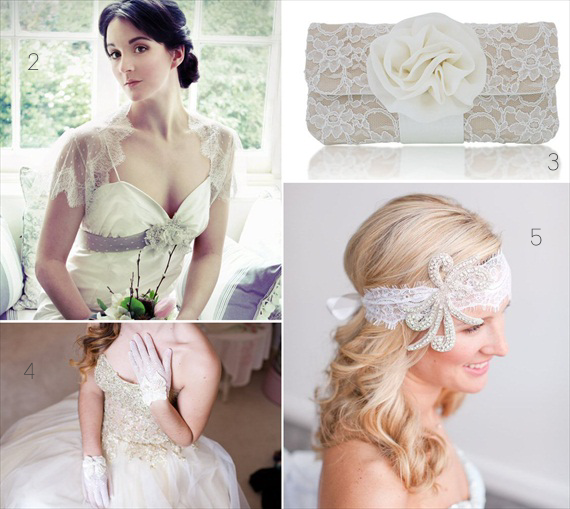 We’ve hand-selected the following lace bridal accessories (all handmade!) to show you how to pull together a perfect bridal ensemble. You don’t have to use all of these pieces (less is more) but we encourage you to pick pieces that really inspire you. Which of these is your favorite? 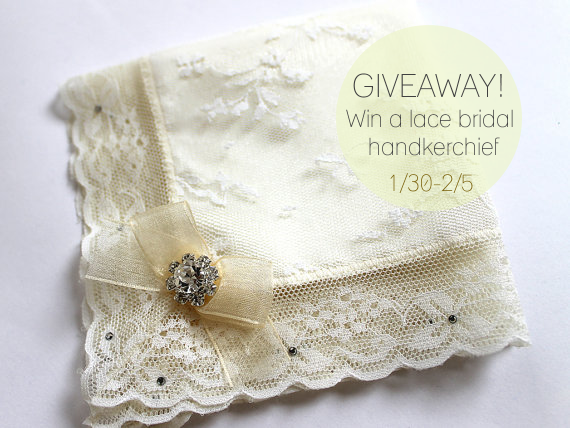 Now that you’ve seen some of our favorite lace bridal accessories, it’s time to win one of your very own! We’ve teamed up with Aristocrafts to offer a beautiful lace bridal handkerchief to one lucky reader! 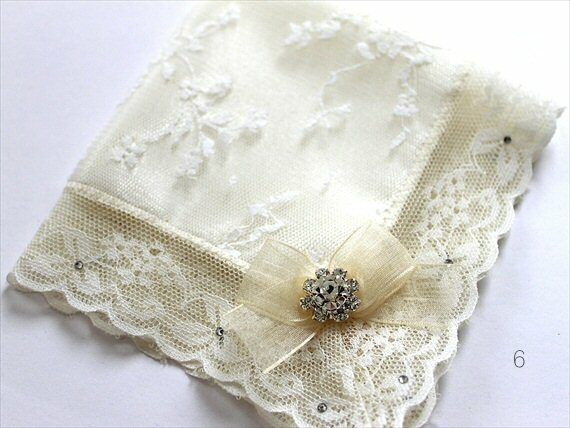 This handkerchief is vintage-inspired and is made with soft ivory lace and ivory satin fabric. The border lace trim is hand-embellished with authentic Swarovski crystals; one corner of the handkerchief features a delicate ivory organza bow and sparkling rhinestone embellishment. Measures 9 inch square. Wrap the handkerchief around your bouquet as a wrap or place in your clutch for tears of joy. Enter between 1/30-2/5/14 (11:59pm EST). Prize value: $49. No cash value. Free shipping to U.S. and Canada only. Past giveaway winners within 30 days not eligible to win. Winner announced on 2/6/14 on this blog post and contacted via email. Be sure to check your inbox (and spam) and respond to winning email within 72 hours — or a new winner will be selected. Use entry form below to enter. Good luck! Now it’s your turn: what’s your favorite lace bridal accessories above? Tell us about it with a comment below! I love the lace double headbands! I love the tiffany blue hankie! I like the mother of the bride and groom wedding hanky gift set. I like the Tiffany blue -teal handkerchief! I like the mother of the bride and groom hankies. I love the monogram wedding hankie! I like the custom vintaged monogram necklaces. Those shoes are amazing and so cute and vintage without being over the top retro! I like the Vintage Map Toiletry Bag ! I absolutely love the Cameo Hanky! It’s the perfect mix of rustic and vintage and just beautiful. I actually love that hanky! Love the hankie! The little brooch is adorable!